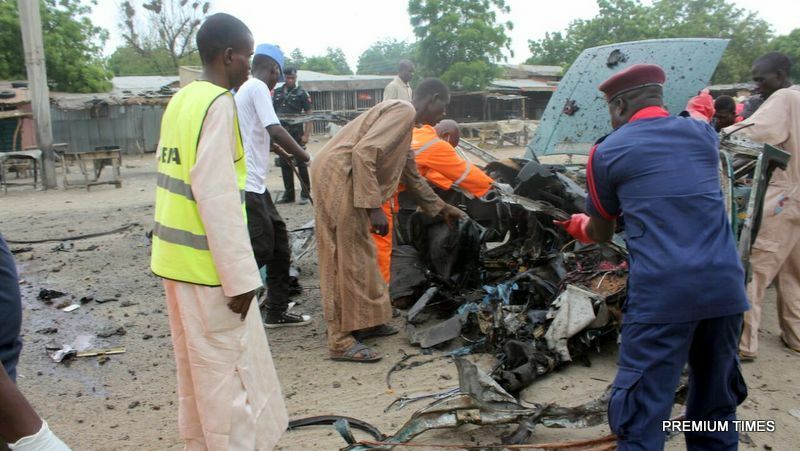 Multiple bomb blasts hit Maiduguri early Friday with many feared dead. The News Agency of Nigeria, NAN, said the attacks were carried out by suspected suicide bombers around the NNPC depot on Damboa Road, Maiduguri. The police command’s spokesman, Victor Isuku, confirmed the blasts on Friday. “Our men are still working at the scene,” NAN quoted Mr. Isuku as saying. He promised to supply details later. A witness, Abubakar Kaumi, told journalists at the scene that the blast occurred around 3 a.m.
“A woman suspected to be a suicide bomber walking alongside two girls came round the depot. “They detonated their explosives near some petrol tankers parked there, and destroyed the three vehicles. “Gladly, nobody was closed by, so, only the three bombers died,” Mr. Kaumi said. An official of the National Emergency Management Agency( NEMA), Abdul Ibrahim, also confirmed the report. “Three suspected suicide bombers detonated their explosives along Damboa road, Maiduguri, in the early hours of Friday, destroying three petrol tankers parked near the NNPC depot,’’ Mr. He said that the fire caused by the explosion had been brought under control while rescue efforts were ongoing.